The HJC CL-17 Full-Face Motorcycle Helmet continues the HJC tradition of great value with their "bread and butter" CL-series. It is one of the least expensive motorcycle helmets available that meets both DOT and Snell 2010 safety standards. (Sizes 3XL - 5XL are only DOT approved). The HJC CL-17 Full-Face Motorcycle Helmet has an advanced polycarbonate composite shell that is lightweight and has a superior fit and comfort using advanced CAD technology. It features an aerodynamic shell shape that reduces turbulence, impact absorbing, multi-density EPS liner and an ACS Advanced Channeling Ventilation System and anti-fog system. The CL-17 also has a SuperCool™ removable/washable interior lining and a Pinlock® prepared HJ-09 shield and RapidFire Shield Replacement System. 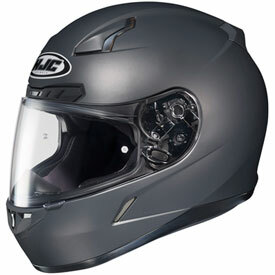 The HJC CL-17 Full-Face Motorcycle Helmet is comfortable, not too heavy and an excellent bargain. Lightweight, superior fit and comfort using advanced CAD technology. Aerodynamic shell shape reduces turbulence. Impact absorbing, multi-density EPS liner. Full front-to-back airflow flushes heat and humidity up and out. Chin bar intake vent provides airflow across the shield interior to help eliminate shield fogging. Side chin bar venturi exhaust vents for increased heat and humidity dissipation. Multi-layer contoured cheek pads improve fit and comfort. Glasses grooves accommodate riders who wear eyeglasses. Pinlock® prepared HJ-09 face shield with anti-scratch coating. Optically correct, three dimensional design face shield offers 95% UV protection. RapidFire™ shield replacement system allows for quick, secure and tool-less shield removal and installation. Nylon strap retention system neatly secures chin strap/snap. DOT and Snell approved. Sizes 3XL - 5XL are only DOT approved. Best price for a Snell m2015 helmet. Looks nice and fits well. Got it for track racing in the car, my only concern is whether it will clear the roof with how tall I am and not having to recline the seat to far. does the hjc cl-17 come snell 2010 or 2015 rated? BEST ANSWER: The CL-15 is rated SNELL 2015.